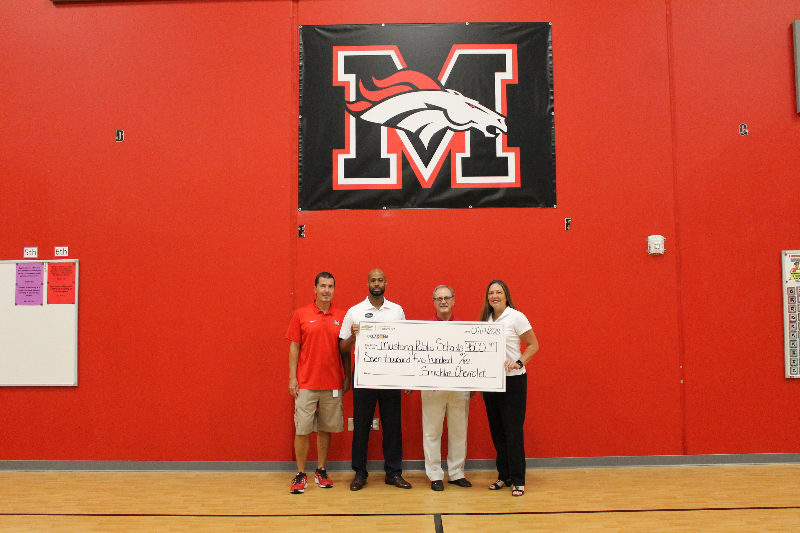 Sarah Mackey, the financial education specialist for Weokie Credit Union, presented a $1250 check to MPS Foundation. As part of BancFirst's purchase of Bank of Commerce, Doug Tippens, president of the Mustang branch of BancFirst, presented a donation of $3300 to the Mustang Public School Foundation. Tippens said BancFirst CEO David Rainbolt provided $10,000 for Tippens to give to the charities of his choice as part of the purchase. Tippens elected to split the money between three public school foundations in his service area. "I believe in education," Tippens said. "These foundations make it possible for teachers to provide extra learning opportunities for their students." Steve Wilson, president of the Mustang Public School Foundation, said the money will make a difference in the lives of Mustang students. "This is fantastic," Wilson said. "I wish people realized how much this means to teachers and the schools. Eventually, teachers will be able to apply for grants they'll be able to use toward special projects for the kids to learn and that's what it's all about." Doug Tippens, president of the Mustang branch of BancFirst, formerly Bank of Commerce, presents a check for $3300 to the Mustang Public School Foundation. Pictured are (from left) Mustang Public School Superintendent Sean McDaniel, Tippens, Mustang Public School Foundation Steve Wilson, MPS CFO Nancy McKay, BancFirst Senior Vice President Stan Griffin and MPS Deputy Superintendent Charles Bradley.